Showing results for tags 'gibson'. A few weeks ago I started working on a pair of basses based around the old Gibson RD style from the late seventies/early eighties.... The basis of the Gibson RD was not too far removed from the classic Thunderbird design, however the through-neck of the Thunderbird and Firebird were eschewed in favour of the more familiar Gibson set-neck approach. 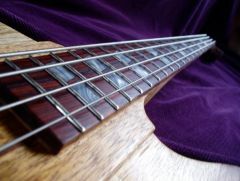 The hardware was typical of Gibson basses at the time being a three-point bridge with its own little quirks. The two configurations ("Standard", "Artist") came passive with small soapbar humbuckers or active with a full Moog-designed filter circuit and larger low-output humbuckers respectively. 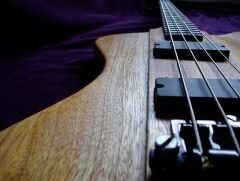 Following the weirdness of the seventies, the originals were all-Maple contrary to the general Mahogany madness usually associated with the Gibson name. These are certainly not authenticity builds, however the design that I ended up with in CAD is not too far removed from the original. As usual, the essential underlying design was put through the "me filter", adding aspects I am more comfortable and familiar with such as volutes, scarf joints for stability, etc. The specification for each instrument is fairly different despite the same underlying design: RD Antrasiitti Body Two-piece Finnish Birch, 40mm thickness Gloss black paint (possibly Nitro) Rear electronics cavity Black pearloid pickguard Neck Finnish Birch neck, laminated from three vertical grained pieces Paperstone fingerboard Nickel-silver frets (2.8mm crown width, 1.4mm crown height) 35" scale 13° scarfed headstock with volute Two-way truss rod Neck thickness taper from 20mm at the 1st fret to 22mm before the heel transition kicks in Fibre-optic side fret markers inlaid in Sterling silver ferrules (white LED source) Electronics Guitar Logistics A8 blade humbuckers in chrome covers (all credit to RestorationAD for the work on these!) Custom differential buffer pre-amp Dual vol/tone RD Hiillos Body Two-piece Sapele, bookmatched curly Birch drop-top (40mm overall thickness) Cream/black 2-ply binding Gloss black back, tobacco burst top (Nitro) Rear electronics cavity 4-ply BWBW pickguard Neck Sapele neck, laminated from three vertical grained pieces Indian Rosewood fingerboard Nickel-silver frets (2.8mm crown width, 1.4mm crown height) 35" scale 13° scarfed headstock with volute Single-acting truss rod Neck thickness taper from 20mm at the 1st fret to 22mm before the heel transition kicks in Fibre-optic side fret markers inlaid in Sterling silver ferrules (flickering red/yellow LED source) Electronics NOS Gibson series 3 humbuckers (originals from a Standard) Custom differential buffer pre-amp Dual vol/tone My usual methods apply here - the instrument is drawn in a flattened top down state with no allowance for perspective distortion of viewing an angled neck or headstock. This is then translated to a side view where actual neck/headstock geometry are added in, before adjusting the top-down view to account for the distortions. This is done specifically for creating the body template and defining neck-body transitions only. The neck and headstock templates are "disembodied" and treated as seperate entities. I always draw only what is needed in CAD....this is functional rather than artistic! 58 Flying V rubber knee pad. Hello everyone! My name is Chad and I'm currently putting together a Flying V kit, and I want to install the rubber knee pad off of the '58 V. I have the rubber pad, but now I need to know the best way to apply it. 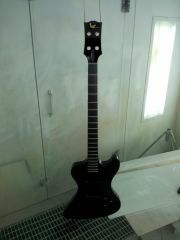 I'm finishing the guitar with a stain and Tru-Oil. What glue would be best to mount this with? Thanks everyone!! So i have a Les Paul and it has a buzzing issue. i checked and double checked all the wiring and everything is ok. I have been playing this guitar for a few years and this just happened. So on a whim I plugged in a regular guitar cable and checked to see if the tip and ring were touching with the bing option on my multi-meter. and sure enough there was! the buzz goes away when i am touching any metal parts but there is still continuity on the guitar cable. what is going on??? I spent at least 3 hours on it already. All of the sudden the buzzing is gone. Any ideas? Hello guys ! Here's a video I've done a couple of days ago Tell me what you think ! Built my own ES175, First timer. Hi Ladies and Gents! Thanks for having me here. Been playing Guitar and Bass for 40 years now in many forms, Garage Band, L.A. scene, Casual and now a Rockin Church Praise team(5 guitars, Bass, keys, drums, Trumpet, Trombone and Sax)............. I am a die-hard Classic Rock fan but also like some mid/late 80's stuff. I find myself listening to early 70's folk type stuff...............Seals and Croft, Gerry Rafferty, Simon and Garfunkel, etc...................... Anyway, I have had a number of guitars in my life but i recently Built one...................... Sort of................... More of an Electric conversion to a semi-hollowbody, i love the 175's and 335's but never owned a real one. So, here is my personal version of a RETRO ES175: **Bought this old Tansen from a band buddy 10 years ago...................pretty basic guitar(I heard it was made by Jackson???) **The pictures explain best but I kept the beefy Jackson Humbucker, which has a splitter, and topped it off with a set of 11-50 Flatwound Jazz strings. It sounds very warm.................fat....................or crunchy if i choose. **I added an acoustic hole as well as the F holes. It actually functions and it sounds decent unplugged. I modified the original pickguard as you may see in the pics........... **I think it looks like an old Gretsch........................sorta Retro with the white and chrome accents. Remember.............I am not a Luthier, i found this to be a very rewarding challenge, i used some non-conventional ideas. Hey, I wasn't sure where to put this, but I was sent this message and thought maybe I would share with everyone. Is anyone familiar with this auction house? Any information would help. "Did you know that one auction house was responsible for selling Jerry Garcia’s guitars for a million dollars a piece, Elvis Presely’s first guitar, Les Paul’s “Black Beauty”, Waylon Jennings' most iconic instruments and a wide array of the rarest Martins (including a 1930 OM-45 Deluxe to the Martin Museum) and other treasured acoustic instruments through the years? That auction house is Guernsey’s*, which is now planning a major guitar auction for the fall. If you have anything from a single treasured instrument to a wide range collection of cool electric or acoustic guitars, give Guernsey's a call. They would be excited to hear form you. *Call 212.794.2280 for more information or visit guernseys.com to read about Guernseys’ 40 year history including, among hundreds of other events, such sales as the ocean liner SS United States (the world's largest auction), the landmark Cold War auction of artwork from the Soviet Union, the sale of the complete archive of Rosa Parks, and the definitive auctions focusing on such iconic figures as John F. Kennedy, Franklin Roosevelt, Princess Diana, Elvis Presley, the Beatles, Mickey Mantle and Jazz greats John Coltrane and Charlie Parker." My grandpa is moving and asked me to clean out his garage, I found a Gibson guitar my grandpa said he bought back in the 80's and forgot all about it and so he let me keep it. I started doing research and see things that make me think its fake but there are things that say it's real. The serial number is 7045 which is a true serial number for a 1961Gibson from the Kalamazoo Plant. There are parts of the guitar like the neck that look like they fakes but also has item's that look real. The fact my grandpa said he paid like $10 bucks for it back in the 80's at a garage sale is the biggest flag it's fake. Thanks for any tips or help. Making The Most Of Early 80's Gibson Neck Pu. I recently picked up an 84' designer series gibson flying V. My first V and yes I love it. Other than the selector wired backwards, the electronics seem to be in good shape but I decided to replace the bridge PU with a Dimarzio tone zone. Works like a charm and sounds amazing. The stock neck pickup howls feedback like crazy with my hi gain loud volumes and has too much low end. I'd like to save the stocker, I don't use the neck PU for anything other than a weaker vintage sound so the tone is ok just too bassy. I'm thinking of wax potting the bucker and maybe experimenting with a cap in series. I have the tools to do the wax potting so I will start with that but I haven't done anything with caps before. Any advice? This is a project which will have a reasonably lengthy build-up time, so this thread exists purely to gather information, consolidate the design and work methodologies. A little background. I have never built an acoustic or archtop previously to this, so much of this particular thread will consist of my research and references to information online or from books, etc. The Gibson EB-750 and its sister the EB-650 were extremely rare (less than 100) basses built upon the designs of the Gibson ES range. The EB-750 was (as far as I am aware) the same underlying design as ES-175 but with a bass neck and a bridge placed further towards the rear of the instrument. My initial proposal is to build two basses, one with the same archtop design as the ES-175 with the longtitudinal braces and another with the more ES-335 style of build having a large solid central block between the arched back and top. I predict that these builds will be more likely to happen towards the end of Spring or worst case towards Autumn 2013. In the meantime I will be examining and refining more of the project specifics including things like moulds, methods of making the sides (laminating/bending) and the all-important back and top carving. Hopefully throughout the process we can document and critique processes fully for the purposes of tutorials, etc. Is anybody familiar with the EB-750 bass or in fact the ES-175? There is plenty of room for discussion on this one.... Cheers.